After numerous leaks about the iPad Mini lately, we now have something that claims to show us the true dimensions of the device. The schematics, purportedly given by an Apple supply chain source, show the 19-pin dock connector and the two speaker grills that flank it, which we've seen in all other leaks before. There is also a rear camera of unknown resolution. The new info, however, is the size - the iPad Mini is shown to be just 0.29" (7.3mm) thin, almost as slender as the iPod touch, which will make it the slimmest slate on the market. It is also allegedly 5.3" (134.7mm) wide and 7.87" (200mm) tall. 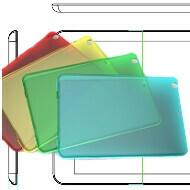 Next, the source calls the screen size 7", whereas all we've heard so far is 7.85", which is closer to 8", and says a case maker has provided it with exclusive photos of the wrappings it is producing for the iPad Mini. They are in your usual assorted colors, and reveal the places for the eventual ports and buttons on the device. We are putting them all in the slideshow below, followed by all the alleged pics of the device's chassis that leaked so far for comparison. My thoughts too. I would be shocked it it didn't have a "retina display," which means the gpu will be working harder as well. The current iPad is among the best performers when it comes to battery life in the current tablet marketplace. There is no reason to believe Apple will drop the ball in this aspect. Not only that but, if that Rear camera is the same one that's on my iPhone 4S then that would be a joke. Moreover, if they use the same Front Facing Camera then, that would be truly iPathetic. My guess, though, is that they will save the Front Facing Camera for the "iRefresh" in six to eight months: iPad Mini S.
While I doubt Apple will improve on the front facing camera for this iPad (if real), I do believe they really should. There is a lot of potential for a front facing camera for tablets and I think Apple should take advantage of that. As far as the rear camera, I think the current iPhone's camera is more than enough to be good enough for this tablet (and keep cost down). I'm slightly confused. How would having an 8mp camera on a tablet be a joke.... Find it unlikely anyway. Its far more plausible that it would have the same camera on it as the current 'new' iPad or something lesser like the iPod Touch. The mock-up leak of the new iPhone has the same small proprietary docking connector as seen here. Surprise, surprise; they're changing it to require a whole new set of accessories (which accounts for more than the majority of Apple's mobile profits--accessories). Why is that? You will only need the charger and accessories if you have the new one. Can't see what is the problem with it. This one is just NOT for me. It is too BIG for an iMiniPad, and too SMALL for an iMaxiPad. A double fail in this arena. I'm glad to see that my predictions back when Steve Jobs died were accurate. I said "Watch, now that Apple's dictator has died they'll become a normal electronics company and will release products to cover many different markets in response to competitors designs. Instead of being a company who releases what they want and think they know exactly what is best for the customer." So now they not only have their 10" tablets, now they're releasing a small tablet to compete with the 7" market. While they're also releasing the 4" iPhone to compete with the ever growing screen size expected of the leading edge Android flagship models. My next prediction is that now that they are responding in kind to their competitors, they also have lost the momentum that they once had as being the "reinventors" of technology segments. Their eyes are no longer looking ahead thinking of the next big step, their eyes are looking sideways to see what their competitors are up to. Steve Jobs did a great thing in the momentum he gave the company before he died. I'm sure it will take a while before the Apple hype train slows down. But just like any company who has lost their visionary, they'll continue to make money. But they'll be a shadow of their former glory. If real, this looks like it would be a big success for Apple. I think there is a big market out there for the 7" tablet range and with Apple's influence on the market this would be sure to be a top seller. Depends on the price. I would (am currently considering) purchasing a Nexus 7 but only because of the cost. £159 is less than the cost of an iPod Touch (for example), and the Nexus 7 has obvious large advantages over such. My only confusion is that if the iPad Mini does reveal itself, is it going to be competitive in price. Apple are many things, but cheap isn't one of them. Since it would be priced between the Touch and below the iPad, I would guess around £299. But I think the only reason the Nexus 7 is such big hit is because of the price. It's almost low enough that you can buy one without having to justify its purpose. The N7 is a big hit because of the price point along with what you get. If it had a dual core with ICS than not really a great deal but since we are getting a true quad core with the latest, most advanced software, its a great deal! Quite true. As I said, it's even cheaper than an iPod Touch (as an example) and vs that it's quite amazing value. If this is true then I'm surprised Apple have made the top and bottom bezels (in portrait mode) larger than the side bezel because 1) the bezels were more or less the same on the regular 10" iPad (creating a photo frame look), and 2) it ironically makes it look a lot like Google's Nexus 7... LOL.